Belt consisting of a cord of twisted plant fibres, somewhat greasy in appearance, onto which have been strung a series of disc-shaped beads made from rectangular strips of iron bent into loops with the ends just touching. These are still a metallic gray colour, but are showing signs of red surface rust. Four nuts in the shape of depressed spheroids covered in small knobs have been perforated through the centre and strung along the body at regular intervals. These are a dark reddish brown colour (Pantone 497C). There is a further perforated nut that is a darker brown colour but similar in shape (Pantone black 7C). This belt has also been strung with a series of tassels, looped over the top of the beads so they are able to slide along the body sections between each raised nut. Two of these are made from a single rectangular strip of dark brown animal hide (Pantone black 4C), looped over the belt body and then knotted below, with the ends split into four thinner strips which hang loose from this point. There are three further tassels made from similar hide strips, onto which have been fitted narrow light yellowish brown hollow reed cylinders (Pantone 7510C); these have been pushed right up against the underside of the belt. The ends of each cylinder has been burnt black. Two have split down the body on either side, and have been held together with a piece of cotton string, wound several times around the body. One of these has been firmly tied; the other has an end that is loose and has a tendency to unravel. The belt is complete, and has a weight of 126 grams. It is 534 mm long as strung, and has a diameter of 360 mm when outstretched . The longest tassel has a length of 230 mm; the hide strips are 8 mm wide at their broadest point, and 4 mm wide where the hide has been split. The cylinders are 37 mm long and have diameters of 8.5 mm. The iron beads vary slightly in size, with the smallest measuring 4.8 mm in diameter and 3 mm in height, and the largest being 8 mm in diameter and 4 mm in height. The nut beads have diameters of 14.7 mm and heights of 12 mm. This object was found in the Museum collections in 1942, having not yet been accessioned. The original donor of the object is not certain, although it was tentatively assigned to Armine Charles Almroth Wright at the time, based on the likely object provenance, in which case Wright was probably collector as well as donor. This is not the only possibility however, as Seligman had also donated Acholi material to the museum prior to 1942, while a group of Acholi material was given on loan by Samuel P. Powell in 1940. 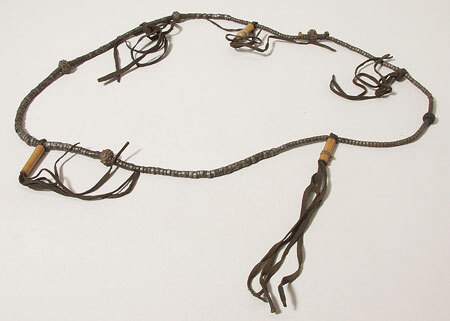 An Acholi origin for this item is possible; the irregular-shaped nuts used as beads also appear on an Acholi necklet, now in the Museo Preistorico ed Etnografico 'Luigi Pigorini' in Rome, accession number 96122 (Boccasino, 1964, "Contributo allo studio dell’ ergologia delle popolazioni Nilotiche e Nilo-camitche. Parte quarta. Il vestito, il tatuaggio, le deformazioni del corpo, gli ornamenti e la circoncisione", Annali Lateranensi XXVIII, fig 47). These type of bead also appears on neck ornament 1942.1.449, which has both Acholi and Lotuko affinities. Schweinfurth discusses the role that early iron beads had to play in the Southern Sudan, amongst groups like the Jur Luo: "Iron beads or perforated little cylinders of iron… were earlier in use than glass beads… In the Soudan these string of beads were principally made at Wandala, and Barth has specially noticed them at Marhi. Every tribe which I visited in proceeding inland from the Gazelle I found to retain the preference for beads made of iron" (G. Schweinfurth, 1873, In the Heart of Africa Vol. I, 203-4). By the early twentieth century, they appear to have lost their pre-eminence, as glass and plastic beads grew in popularity. Accession Book Entry [XI, p. 75] - The late H. BALFOUR, Esq. F.R.S. Specimens from different parts of AFRICA found unlabelled. As it is impossible to identify the real donor, or donors, it is assumed for convenience in using the Donor's Index that the specimens are given by Mr Balfour. Mostly without indication of provenance. [p. 89] 1942.1.448 - Belt of iron beads threaded on a twisted hide thong, with globular wooden beads covered with small knobs and tassels of leather thongs, partly with threaded-on small reed cylinders placed at intervals. No provenance. UPPER NILE region (?ACHOLI). Card Catalogue Entry - Details as in accession book entry, with comment 'found unentered. Ascribed to H. Balfour [RTS 30/1/2004]. Old Pitt Rivers Museum label - Belt of iron beads, ?UPPER NILE (?ACHOLI) 1942.1.448 [rectangular metal-edged tag, tied to object; RTS 12/7/2004]. Sparks, Rachael. "Acholi belt" Southern Sudan Project (in development). 03 Jan. 2006. Pitt Rivers Museum. <http://southernsudan.prm.ox.ac.uk/details/1942.1.448/>.